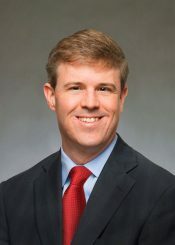 Lucas B. Gambino is the General Counsel and Vice President of Coca-Cola Bottling Company United, Inc.
Lucas has more than 18 years of experience in banking and corporate law at Maynard Cooper & Gale. He also spent time at the Sirote & Permutt law firm in Mobile, Alabama. As a 1995 graduate of the University of Alabama at Birmingham (UAB) with a degree in accounting, Gambino went on to graduate from the University of Alabama Law School in 1999. He was raised in Fairhope, Alabama, where his family worked in the restaurant business both in Fairhope and Mobile. Lucas is a board member for the Alabama chapter of the National Conference for Community and Justice (NCCJ). He was also named one of America’s Leading Lawyers for Business, Banking, and Finance by Chambers USA. Lucas lives in Vestavia Hills, Alabama, with his wife Sawsan and their three children.